Fermier is a high ceilinged family cottage which lies alongside the pool. Completely refurbished to sleep up to eight people, the cottage has a spacious sitting and dining room with beamed inglenook fireplace with wood burning stove and modern kitchen leading onto the private patio and garden. The master double bedroom has a 5' bed and ensuite shower room. There is a second double bedroom and one twin room and a beamed attic room created with two children in mind. The Domaine de Peyloubere is a beautiful 17th century Gascony estate set in 35 acres of woodland, lakes, gardens and tall trees. All the cottages, which sleep from 4 to 8 guests, have been refurbished and re-equipped. Three of them were once the staff homes and have been updated to incorporate modern comforts while maintaining their original period timbered character. 'Les Rosiers' is in the oldest wing of the main house and 'Les Iris' has been created from the old coach house. All have their own access, garden and barbecue and share the heated swimming pool (12 x 6m) and sauna with its secluded garden and sunbathing terrace. The owners and labrador, Nina, are resident and have a separate pool. Peyloubere is only 5 minutes walk from Pavie village, 10 minutes drive from Auch, the capital of Gascony, and 1 hour from Toulouse, Albi, Pau, Lourdes, Spain and the Pyrenees. 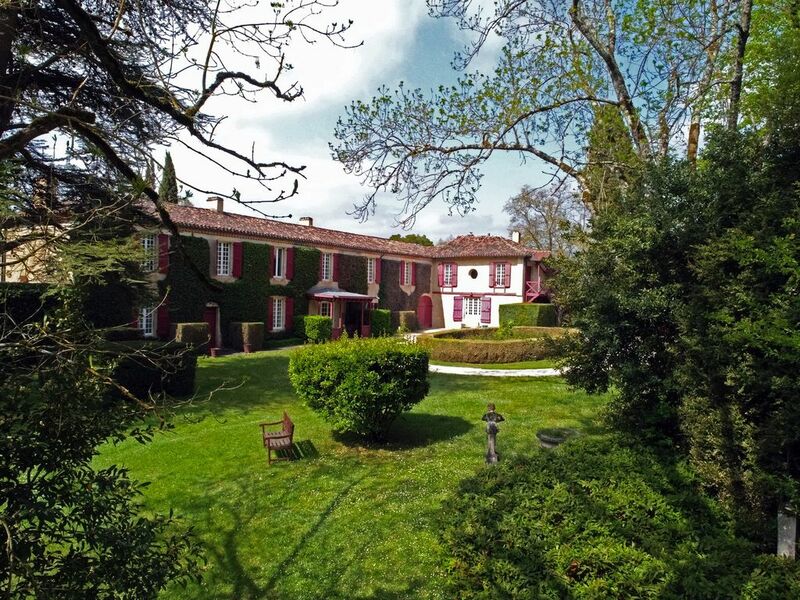 Historic building - previously home of artist: The Domaine de Peyloubere is classified as a monument historique by virtue of the fact that it was the home of the Italian painter and sculptor, Mario Cavaglieri for over fifty years. Legacies of his ownership are the frescoed ceilings and walls in many of the rooms of the Manoir, the graceful Italian garden and the relaxed, bohemian atmosphere of the Domaine. Although a haven of tranquillity and a paradise to explore, Peyloubere is located only 6km from Auch, the historic and vibrant capital of Gascony, with its famous cathedral and many restaurants, markets, shops and festivals. Lots to do and see for all the family: Also available on site - table tennis, badminton and a football lawn which is also ideal for cricket and other team games. There are also lakes and a river for fishing and the woodland and gardens for peaceful walks, bird watching and wild flower collecting. Toulouse, Albi, Lourdes and the Pyrenees are within one hours drive and there are many interesting places to visit close by, including Armagnac chateaux, mediaeval villages, foie gras farms, leisure lakes and major jazz and music festivals in Marciac and Mirande. The village of Pavie is 5 minutes walk away, ideal for breakfast croissants. There is also a riding stable in the village and three others close by. Bed and Breakfast - Chambres d'hote: Two suites of rooms are available for one night or longer in the listed wing of the Manoir. Previously the accommodation of Mario Cavaglieri and his adored wife, Giulietta, the rooms have been fully restored to exhibit the fascinating frescoes on ceilings and walls. The first of these,'The Cavaglieri Suite' contains most of the frescoes and comprises a large bedroom with venetian four poster, a luxurious bathroom and a sitting room. The second suite is 'The Garden Room' with en-suite bathroom. Prices per night for two people including breakfast are €130 for the Cavaglieri Suite and €90 for the Garden Room, or €140 and €100 respectively if guests wish to stay for a single night. Both suites are available all year round. Internet access is available free of charge in all cottages and the chambres d'hôte via a Professional WiFi Hotspot. We moved to France from London in 1999 and our son was educated in Auch and has recently returned from studying and working in China. Our daughter lives and works in London. We are very fortunate to live in this beautiful part of France and love to welcome our guests to Peyloubère and to share with them our knowledge and enthusiasm for the surrounding area and help them to enjoy a memorable holiday in the Gers. We 'discovered' the Gers over twenty years ago and at once loved the combination of a rich history, beautiful rolling countryside, delicious local produce and cuisine, an excellent location from which to explore Europe and, above all, the warm and happy people who welcomed us so generously into their midst. You only have to drive under the magnificent cedar trees either side of the entrance gate, up the drive into the circular rosegarden, see the ivy clad Manoir with its basque red shutters and hear the song of birds and the sound of water cascading over the waterfall to know why we were at once bewitched by Peyloubère! All of the cottages have their own private access and garden, garden furniture and barbecue. There are also loungers, tables and chairs around the pool and in the Pighouse garden. Cots and high chairs are available free of charge. Six of us enjoyed a great week in June in Le Fermier. The grounds were extensive and beautifully landscaped with large spaces for play and relaxation. The cottage itself was spacious and well - equipped and lots of dvds and books available should the weather turn inclement. The pool was large and allowed a good swim. We were welcomed by Theresa who was leaving the next day for the uk but were well looked after by Stephanie during our stay. Although quite rural the large supermarket in Auch was only 10 minutes drive away for supplies. A couple of smaller saucepans / frying pans could be added to the kitchen utensils. Would certainly book again if visiting the area. We are delighted that you enjoyed your stay at Peyloubère and will hope to see you again in the future. Good point about some smaller pans and many thanks for taking the time to write a review. Our party was four (female) friends who had met at university 40 years ago and who wanted quiet accommodation in an interesting area to catch up and spend time together. Peyloubere more than fit the bill; we took Fermier, and arrived on a Friday to find everything spick and span, well equipped and spacious. Lovely wood burner in the generous and comfortable sitting/dining room (logs were readily provided on site); lots of space in the kitchen for all of us to gather and share the cooking, and delightful grounds and sauna. Theresa was on hand to deal with any queries, and everything was managed very efficiently. We found Auch more interesting than anticipated, especially when Theresa told us that the annual circus skills festival was taking place (we went to see some of the student acrobats performing their assessed pieces in one of the many big tops around town). The Thursday market by the river was a delight, and the Saturday one fine if smaller than the main one. Plenty of local information on hand to find walks and activities, but the autumn sunshine in the courtyard and grounds meant we were very happy around the house. Lots of birdlife around the houses (including an owl) and the landscaping of the cottages was cleverly organised so that nobody was overlooked and everyone had some private outdoor space. We plan to return! If anything, the website doesn't do full justice to the estate or the accommodation. It was factually correct but our stay actually delivered more than we were expecting. We didn't want for anything during the entire fortnight. The house was absolutely spotless and beautifully furnished. The beds were really comfortable and the bathrooms were clean and modern with good water pressure - a good shower is always important! The renovation has been done faultlessly, the original features have been preserved and highlighted. We cooked at home for a large family nearly every night and the kitchen was well equipped to manage. Our toddler was absolutely delighted with the toybox provided. The grounds surrounding this property were simply stunning. Much work goes into maintaining the gardens and pool, which was also spotless. My partner enjoyed many happy hours fishing at the lake and our little daughter relished feeding the ducks at least twice a day and sometimes more! There are plenty of shady spots in the private garden to hide from the sun as required. We found the area suited our needs but we didn't venture too far as we were so comfortable at Peyloubere. Good supermarket shopping facilities are close at hand and Pavie is a nice little village for tabac and pharmacie etc. Ian and Theresa and their staff were always available but the customer service is discreet - something we appreciated. We would definitely recommend this property to anyway - it is a blissfully quiet spot yet convenient for a family. The peace and beautiful surroundings will stay with us for a long time and we will definitely be returning! We had come to France for my brother's 60th celebrations (he lives nearby) and we took the largest cottage for a week in October half-term. We were 9 people - grandparents, 2 sets of parents and 3 children aged 7, 4 and 1. The cottage was ideal for our group and was well equipped and clean. Our only gripes were the lack of coathooks for wet macs and no indoor drying facilities (it rained a fair bit). The central heating worked well, though. The children loved Suki and Meg, who patiently allowed themselves to be comprehensively mauled and who accompanied us on stick-throwing trips to the lake. They also loved their special low-ceilinged bedroom. It was too cold to use the pool but we used the spa a lot and also the ping-pong table. There's a great Carrefour nearby plus 2 boulangeries in the village, not really within walking distance but only 5 mins by car. There is plenty for children to do in the summer, the estate is really beautiful and the owners were very helpful. We have noted the comment about coat hooks and have installed some over the radiator in the laundry room. Domaine de Peyloubere is situated in the Department of the Gers in South West France. The 35-acre estate lies just outside the village of Pavie which is 10 minutes south of Auch, the historic and vibrant capital of Gascony. The nearest airport of Toulouse Blagnac is 55 minutes from Auch; Pau is 1h30, Biarritz, Carcassone and Bordeaux two hours. DISCOUNTS : for reservations of two weeks or more during the high season a discount of 10% per week is offered making the weekly price only €1701 for seven nights in Fermier A 25% discount is offered to COUPLES during mid and high seasons. Pour des réservations de deux semaines ou plus en haute saison, une réduction de 10% est offerte, ce qui rend le prix par semaine seulement 1701 € pour sept nuits à Fermier Pendant les saisons moyennes et hautes, LES COUPLES profitent d'une réduction de 25% sur les prix. LONG WEEKENDS - during the low and mid seasons long weekends and shorts stays during the week are offered. The minimum stay is three nights and the rate for a stay of three/four nights is 800€ in the low season and 900€ in the mid season. For stays of five to seven nights the weekly rate applies. For details, contact the owner.